Whether you are looking for a midweek or weekend break with the family or just the two of you, our latest glamping dome additions at Loch Tay will provide you with a cosy and alternative holiday accommodation. This dome can comfortably sleep up to 3 people (2 adults & 1 child). You have your own private outside BBQ & picnic area and also full access to the amenities block & kitchen. 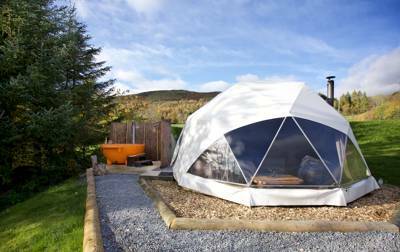 Discover an unusual twist to glamping with our latest addition to Loch Tay Highland Lodges, one of our Domes with the addition of a Wood Burning Hot Tub!! Whether you are looking for a midweek or weekend break with the family or just the two of you, our latest glamping dome additions at Loch Tay will provide you with a cosy and alternative holiday accommodation. These domes can sleep up to 4 people (max 3 adults) and has a spacious interior. On your own private decking you will find a wood burning ''Dutch Tub'' and a BBQ with picnic area. 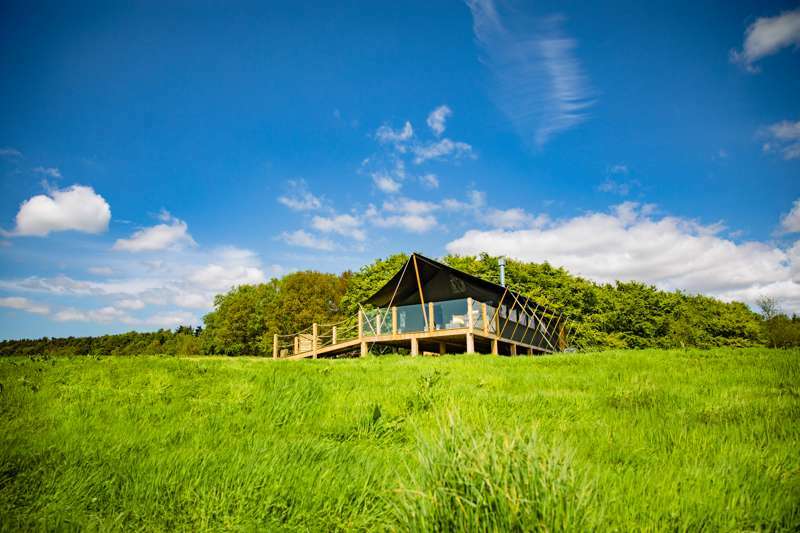 Perfect for families and couples alike, our wigwam accommodation offers a more cosy and quirkier alternative to the twig snapping of traditional camping. Whether you are looking for a short mid-week break in the Scottish Highlands, or a longer stay, our timber Wigwams at Loch Tay Holiday Lodges are furnished with a few home essentials for a comfortable break away. 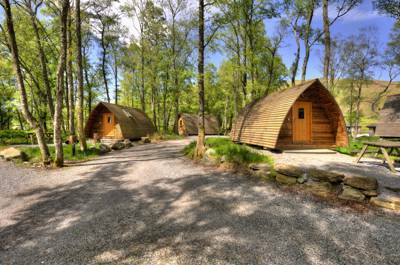 Our Wigwams are located in a quiet, secluded woodland area of Loch Tay Holiday Park. Quirky and unique, our brand new premium Wigwam accommodation at Loch Tay provides the ideal glamping experience for a long or short midweek break. Sleeping up to 4, our premium timber Wigwams are beautifully located with spectacular views of Loch Tay and Ben Lawers, offering private fire pits and outdoor eating areas to take in the Highland scenery. Each premium Wigwam is furnished with a double bed, pullout sofa bed, dining space and a compact kitchen with cooking facilities. Quirky and unique, our brand new premium Wigwam accommodation at Loch Tay provides the ideal glamping experience for a long or short midweek break. Sleeping up to 4, our premium timber Wigwams are beautifully located with spectacular views of Loch Tay and Ben Lawers, offering private fire pits and outdoor eating areas to take in the Highland scenery. 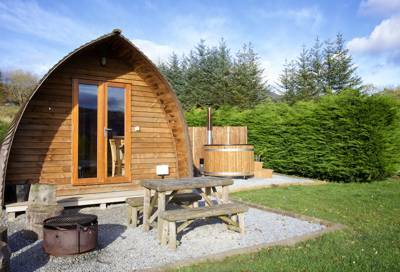 We have upgraded some of our Premium Wigwams by adding a private eco, wood-fired hot tub; making any stay at Loch Tay that little bit more relaxing. 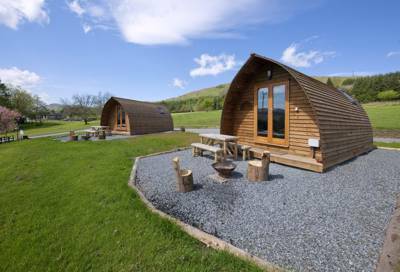 Our premium Wigwams are beautifully located with spectacular views of Loch Tay and Ben Lawers mountain range- an ideal backdrop for relaxing in the hot tub after a full day of activities in the Scottish Highlands. Scotland is one of the world’s great active destinations, its mountains, rivers and lochs brilliant for getting right in amongst the great outdoors and campsites don’t come any more ideal for adrenaline junkies than Loch Tay Highland Lodges. At the foot of the site they offer both canoeing and kayaking, boat hire, fishing and thrilling RIB rides from their own Loch Tay marina, while they also rent out mountain bikes. Then there is the new hiking path that links up with the epic trail up Ben Lawers, which at 1,214m, is Perthshire’s highest mountain and higher than any mountain in England and Wales. Just a scenic drive or cycle along the banks of Loch Tay and the River Tay’s whitewater charms await. Loch Tay no longer takes tents, but there are plenty of alternative accommodation offerings from cosy, heated wigwams to glamping domes and woodland cabins. All have access to a stirling wash facilites, common room and the fully-equipped camper's kitchen (the premium wigwams boast their own cooking facilities). 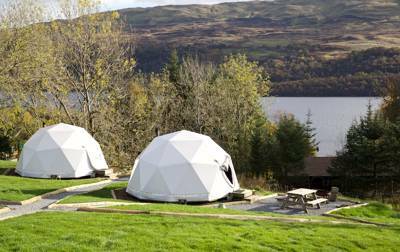 The domes sit in the old camping field, enjoying views over Loch Tay and back towards the mountains. A childrens’ playground, putting green, communal campers room with large flat screen TV and leather sofas and the waterfront Boathouse Restaurant complete the resort-style experience on this 140 acre seriously adventurous estate. From Cottages and Cabins to Wigwams and Domes, all set amidst breath-taking scenery in the foothills of Ben Lawers and the bonnie banks of Loch Tay. Welcome to the perfect location for your holiday! Our onsite restaurant ‘The Bistro’ is situated beside the marina and enjoys huge picture windows with sun decks offering uninterrupted views over Loch Tay. Its welcoming ambience combined with this spectacular setting provides guests with a superb location to either enjoy a drink or dine and experience home cooked food with warm hospitality in this most beautiful location. For the ‘Glamping accommodation’, our newly installed amenities block offering showers, toilets, drying room, and launderette meaning you have all the mod-cons at your disposal within a short distance from your front door. If you require something more personal the ‘private bathroom’ offers all these facilities but exclusively for you for only a small supplement. Wifi and Children’s Playpark are also available onsite. My partner & I stayed in a standard wigwam for 2 nights as a surprise birthday getaway. The site is immaculately kept & the wigwam was exactly what we wanted - one step up from camping with lots of little home comforts but still with a rustic feel. We stayed in one called Skye & had an amazing view from our picnic table over Loch Tay. We ate in the bistro both nights - the food was delicious & the staff were really friendly & we did some kayaking on the loch - really good value. We would strongly recommend & will definitely be back! 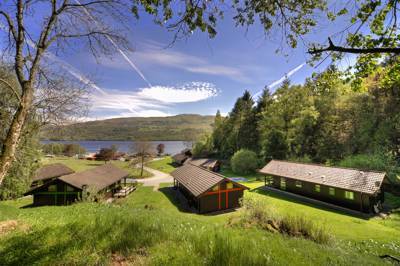 2,3 and 4 bed lodges. Dogs – yes. 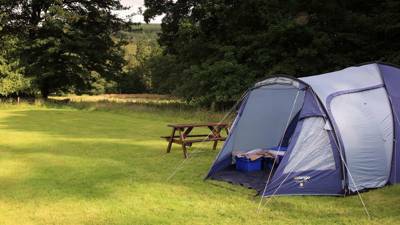 Self pitched tents, campervans, caravans, big groups, young groups – no. 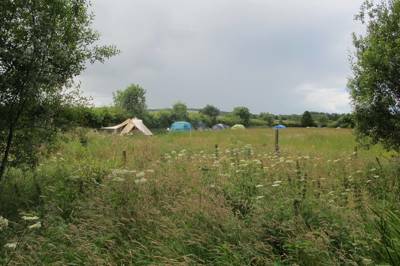 Brand new facilities block with showers, toilets, private bathroom (which can be rented), drying room, launderette and vestibule with woodburning stove. Excellent campers kitchen with additional living area with sofas and large TV. Marina offers kayaking, canoeing, RIB rides, sailing, fishing and boat hire. Other activities on estate such as quad biking and mountain biking. There's also Wi-Fi, a play area, putting green and disc golf. Campfires allowed in the firepits provided. Snuggle up next to the a cosy wood-burning stove and listen to the rain fall on your tent – so relaxing! A path leads off directly up towards Ben Lawers, a serious mountain ascent that should only be tackled by the well equipped and suitably skilled. The Lawers range also boasts a flurry of other Munros (mountains over 3,000ft/914m) to tackle. At the other end of Loch Tay lies the striking Scottish Crannog Centre (01887 830 583), a fascinating insight for all the family into how people lived around Loch Tay thousands of years ago. Also at the opposite end of Loch Tay Aberfeldy is the centre of the River Tay’s whitewater activities. Splash (01887 829706) run myriad trips. The on site family-friendly Boathouse Restaurant offers a wide variety of dishes to enjoy with loch views on the wooden deck overlooking the marina. Bar meals, pizza and pre-ordered packed lunches can all be ordered. Elsewhere, The Bridge of Lochay Hotel (01567 820 272) boasts creative cooking using local produce with the likes of baked haggis bon-bons with a turnip veloute or Scottish ribeye with chorizo. The hotel also has a well stocked bar with local ales and Scottish whiskies. 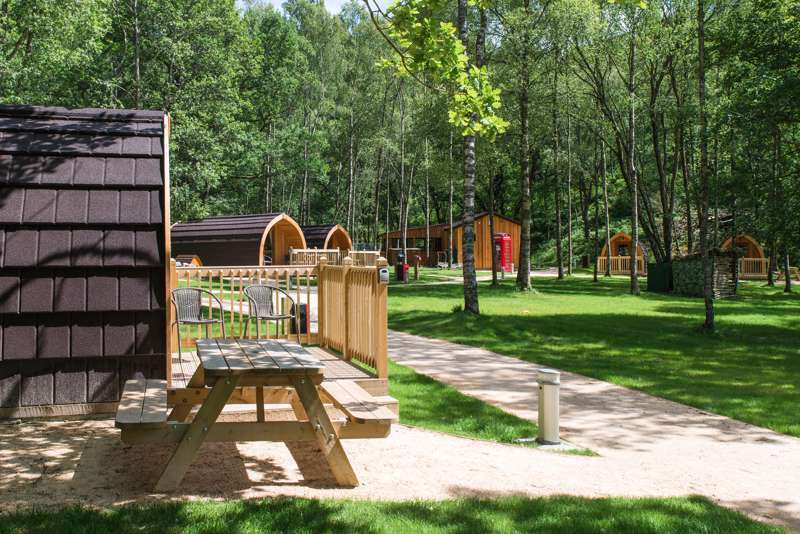 Premium Wigwams (ensuite facilities) - £40 per adult per night & £10 per child per night. Minimum 2 adult charge. Standard Wigwams - £25 per adult per night & £10 per child per night. Minimum 2 adult charge. 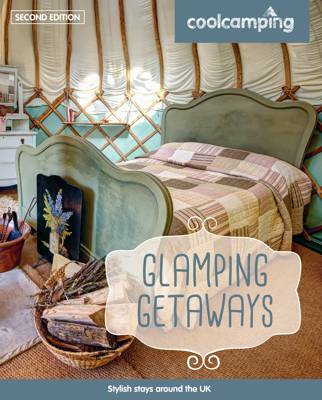 Glamping Domes - £35 per adult per night & £10 per child per night. Minimum 2 adult charge. From the M9 take the A84 to Callander. Continue north from Lochearnhead on the A85 before turning right on the A827 to Killin. Continue through the village and the campsite is signposted to the right after a couple of miles. Caber Coaches (01887 820090) operate a bus service (no. 893) from Aberfeldy to Morenish. The campsite is 10 minutes’ walk from the Morenish bus stop.